NCHRP-350 crash tested and approved. Signs and stands are sold separately. 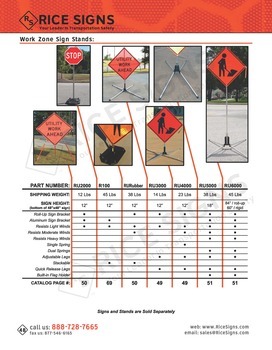 See Single Spring Sign Stand for Roll-Up Signs in our catalog on page 49. 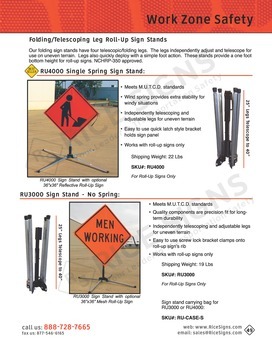 Our folding single spring sign stand for roll-up signs has four telescoping and independently adjustable legs. Roll-up signs mount to the stand with a quick release bracket. The single spring provides extra stability from high winds. Deploys quickly and works with uneven terrain. 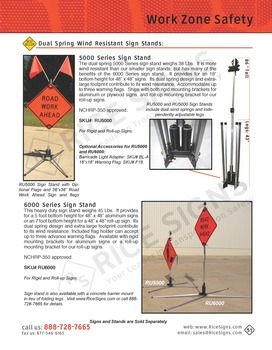 The heavy duty spring on our RU4000 roll-up sign stand helps deflect wind to keep the sign from blowing over. The quick release clamp bracket works with any standard roll-up sign, regardless of sign manufacture. 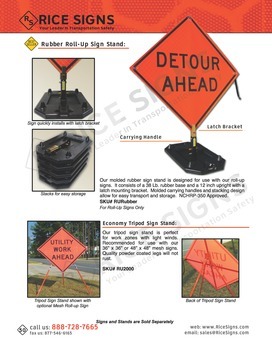 Its spring loaded mechanism clamps onto the fiberglass rib of the roll-up sign.